Niche: Helping people quit their 9-5 jobs and build a successful real estate business. 1. Where Richard was before joining Consulting Accelerator. 2. Richard’s unique definition of technology and how he connects with people from different parts of the world. 3. How the niche training helped Richard find the clarity and confidence to build his own teaching program. 4. The price Richard offers to his clients based on the common pain points he identified and solved in his niche. 5. How Richard landed several clients not only through direct outreach but by also sharing his personal story. 6. Richard’s five-year plan for his business. 7. The most transformative part of Consulting Accelerator for Richard. Sam Ovens:	Hey everyone, Sam Ovens here, and today I have Richard Norris on with us. And Richard's got an awesome story. He joined Consulting Accelerator about ... was it three or four months ago now? Richard Norris:	Yeah, about three months ago. Three and a half months ago. Sam Ovens: [00:00:30]	Three and a half months ago, and back then when he joined, he already had a business where he was investing in real estate basically through a property portfolio, and he wanted to join Consulting Accelerator to learn how to teach other people how they could quit their 9 to 5 jobs and use real estate as the vehicle to do that. [00:01:00]	He wanted to join Accelerator to learn how to turn all of his knowledge and his advice into a program that he could leverage and sell to others. Since joining, he has been able to get six clients ... oh sorry, five clients at six grand each, so about $30,000 in total so far, which is not bad for the first three and a half months. 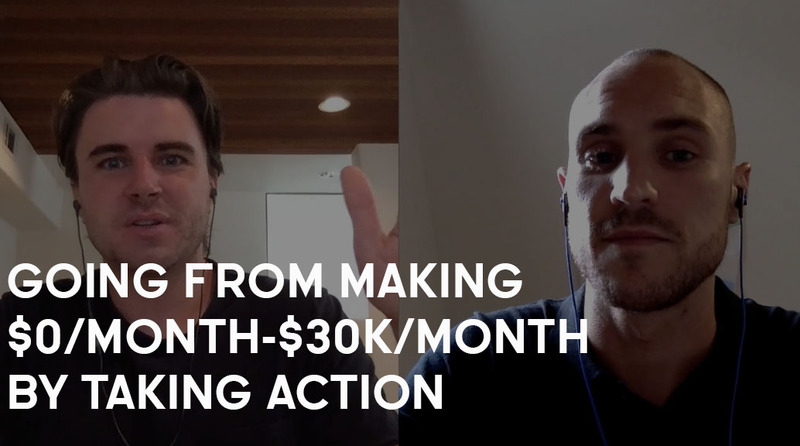 In this interview today, we're gonna dig into exactly what it is that Richard does, why he's passionate about property, why he's passionate about helping people quit their jobs, and how he got his clients, and how he's basically doing all of this. Thanks for jumping on with me here. Richard Norris:	Thanks Sam. Sam Ovens: [00:01:30]	So let's go back to three and a half months ago, which isn't actually that long ago at all, tell me what was going on back then? Richard Norris: [00:02:00]	So three and half months ago I built quite a successful property portfolio, so I built it quite fast. I built my property portfolio using some combination of some of my own money and also a combination of investor's money. So I basically teach people how to use investor's money to buy real estate. So it doesn't really matter about the level of income they've got at any given time, or the amount that they've got in their current bank account, they can still invest in real estate. And I teach them how to do that and create passive income. So three and a half months ago where I was at in my current business was I was basically investing in real estate, and I had sort of what I call, four HMA properties, and I've currently got a commercial office building which I'm converting to 11 apartments at the moment. And I've also got another land development which is happening in Oxford in the U.K., where I live. [00:02:30]	I'm looking to build out five new apartments, they're luxury apartments. So in 15 months we've done quite a lot as a new company. And I started this company on my own, and one of the things I wanted to do, I was really passionate about helping other people basically also escape the 9 to 5 and quit that job because, I guess it's kind of similar to what you were saying, it really resonated with me. And that's why I joined your program as well. [00:03:00]	I do believe that the social paradigm is flawed, and there's a lot of people, especially in the housing market today, where they feel stuck in what I'd call like a renting cycle, where they go to work every day just to afford to be able to pay their rent. And they actually can't get a big enough deposit to get on the housing ladder. And it's causing people a lot of pain. I've seen a few gaps in the market that I feel I can exploit, and with your program I knew that I could basically get my message out there in the best way, and how I could get my market to actually resonate with what it was I was doing. [00:03:30]	I had all these ideas, I was doing it, I was doing quite well, and people were recognizing what I was doing, and I was getting invited to speak at some events and property events about how I'd managed to have this success, and grow it from nothing. After I finished the 11 apartments, which should be finished in about January or February, they're currently on site, then my portfolio, the asset value will be worth up to between 1.5 and 2 million pounds. Just in 15 to 18 months of work. [00:04:00] [00:04:30]	So the results I was getting there were profound anyway, and I thought well, I can really help other people do that. So I joined your program to really understand how to use technology as well, because one of my biggest evolutions of myself that I've had to do, so I understand completely what you say about having to transcend yourself from who you are right now and who you need to become. And that really sort of resonated with me and I really worked on myself and on my mindset, doing my daily affirmations. Starting to transcend myself, and you know for me for example the ClickFunnels [inaudible 00:04:23] was quite challenging, because I haven't been the best at technology in the past and I haven't really evolved as much as I would like to in technology, because I know that's where the market's going. And so, by doing your program it's really helping me to bring a new revolution to the property industry too. Because I think that in real estate investing at the moment, like a lot of the property education's out there, they're all classroom based. And a lot of people I'm finding from the market research, people are getting stuck. They go to their property education classroom, they spend 20,000 pound learning how to invest in real estate, and they haven't got any results to show for it. [00:05:00] Sam Ovens:	You say you're not good with technology. How do you define technology? Richard Norris: [00:05:30]	That's a great question. Technology, anything online I suppose. I'd say new technology, like innovation, like with the ClickFunnels platform, it's completely new to me. But I was willing to do ... I think some of my profound results have been because when I would listen to what you were saying and my drive and my attitude about willing to do just whatever's necessary to evolve and transcend to get the results that I want. And sometimes I was up at four in the morning on ClickFunnels, you know there were certain answers I needed and couldn't get and I need to go on the support to get those, I would just get up at four to do it. Because some of the guys are overseas, some are like India-based, and so they're on at different times. And I really wanted to ... didn't want to basically stop going to the market so I just made sure that I could get to the market as quickly as I could. Sam Ovens:	Do you know Chinese? Richard Norris:	Sorry? Sam Ovens:	Do you know how to speak Mandarin? Richard Norris:	No. [00:06:00] Sam Ovens:	It's just like that, because you've never done it before, it's not the technology. You would find it equally as hard, probably more hard, to just try and learn Mandarin. Richard Norris:	Yeah. Sam Ovens:	Because you just don't know it, and so it's new. So it's not the fact that the thing is technology-oriented, it's just new. Richard Norris:	Sure. Sam Ovens:	Do you see what I'm saying? Richard Norris:	Yeah, maybe one of my limiting beliefs that I need to eliminate as well, but again your program's really helping with that stuff. [00:06:30] Sam Ovens:	Yeah, it always interests me how people define the thing they're talking about, because you're kind of trapping yourself by thinking and believing and saying that. Richard Norris:	Yeah, sure, I understand. And one of my affirmations in my daily affirmations is like, "I understand technology, I'm becoming better at technology every time I use it, and every time I come up with a problem of technology, every time I get over that and find a solution that it's going to help my business to grow and help other people get results". [00:07:00] Sam Ovens:	And then, you're having really good success with building out your property portfolio right for yourself. Why turn to teaching it now, and educating people? Why not just double down, focus in on what's working for you and just grow it bigger, bigger, bigger? Richard Norris: [00:07:30]	There's different strategies in property, and what I've realized is that with the way I've set up the business as a group and I want to get into developments and land developments, and obviously the investment, sometimes when I'm doing the bigger projects, the commercial to residential developments, like cash flow, a lot of cash flow goes out of a company. Also, having a short term education platform, sorry an education platform that provides a different type of cash flow. Where you get paid monthly for your services, or it really helps support the cash flow across the group. [00:08:00]	Not only that, I think my main thing is I'm actually passionate about helping people get results, because one of my biggest why's was trying to help my dad. Because my dad was stuck in the old social paradigm, and he worked 40 years in a bank. And at the end of his 40 years he got a pension, and his pension was what most people would think is really good. But actually, he still can't do the things and have the luxuries in life that he would want. By building a property portfolio and setting up the education platform, I feel that I can definitely help increase his pension. Sam Ovens:	Got it. What is the pension? In the U.K.? [00:08:30] Richard Norris:	Well, the pension you pay into like a pension system, I don't actually pay into one, and therefore because I don't believe in them, so I'm only 27 years old and for me I've never paid into a pension even when I've been employed because I don't believe in them. And that's where the beliefs between my dad and I were really different. And that's why I said like, if you invest your money in a property portfolio, like if I do this for a long term strategy for the next 30 years, my pension's going to be far better than he could have anyway, and what he has got. [00:09:00]	His pension is like the average U.K. wage after 40 years and working his way up into a top corporate bank where he was a very high managerial position. Sam Ovens:	Yeah because my dad, he worked his whole life and then retired. I helped him retire, and then his pension thing was $400 a week. Richard Norris:	Yeah so I think my dad's is about 2,200 a month. Sam Ovens:	Yeah so that's kind of similar-ish. [00:09:30] Richard Norris:	640 pound a week, and that's the thing, like most people think, "Oh, that's a decent pension", but I'm saying to my dad like already as you said, we're doing 3,700 passive income just from our property portfolio that we can definitely draw down on if we wish to. So like my dad already if I wanted to help him out and gave him that, then I've already doubled his pension. Just by investing in property. Sam Ovens: [00:10:00]	The funny thing was when I retired my dad and they moved over to St. Lucia, and now they're in California with me, the pension only is valid if you're in the country. Richard Norris:	Oh wow. Sam Ovens:	Yeah so they've even stopped paying it which I found pretty funny. So like, yeah it amazes me that people, I guess that generation was different. They grew up thinking that you have one job for life, you're committed to that one company for life, and then at the end you get given your pension and you can trust the government with everything. Richard Norris:	Yeah. Sam Ovens:	And now we've learned that all of those things are not true. [00:10:30] Richard Norris:	No, exactly, and that's one of the things I'm trying to get people to do in my program is that you know, there's various schemes in the U.K., like help to buy, and shared ownership schemes, which help people get, like first time buyers, get on the property ladder. And although like definitely they do help, they definitely help, and I leveraged up the help to buy scheme when I was 23 years old, bought my first home in the most unaffordable city in the U.K., which people thought was an amazing result, because most people can't do that. [00:11:00]	And then I actually made money off that scheme. But people don't know how to leverage and use financial [inaudible 00:11:01] to do it, so they end up getting stuck. It's like the government are offering something, but then nobody really knows what it does. And so there's like a misconceived idea. And the reason for that is I strongly believe that the government don't want to understand it fully. Because we're almost like minions and we're almost sort of like- Sam Ovens:	Dude, I don't even think the government understands what they've got. Richard Norris:	No. [00:11:30] Sam Ovens:	I don't think they're smart, plotting, scheming people. I think they're just ... Because I've sometimes thought that too, but then you go talk to someone from the government and then you realize that there's nothing like that going on. Richard Norris: [00:12:00]	Right, yeah. So it's just breaking away from that paradigm. From it all, and understanding that there definitely is a way to break away from the paradigm. You know I was just frustrated, Sam, I was frustrated going to work every day for someone else, and even in the corporate world I was high up, I was a business development manager at 25 years old and running a large territory from Oxford all the way through to Ireland. You know, most people at that point would have deemed me as being successful, but I wasn't happy, I wasn't happy. And the key is to be happy, and actually I'm so passionate about growing a business that's going to help others, improve people's lives, and also help my family members, my dad, increase his pension, and build a legacy and wealth for the long term. And that's why property investing and real estate investing is a good thing, and a good, it's almost like a good secondary income to have as well. Sam Ovens: [00:12:30]	So there's like a million different, or there's more than a million different things somebody could do to make money and to quit their job, why property? Richard Norris:	Because I feel that property is great for two things. The first thing is, that number one you can get a passive income from property. So for example, some people might not necessarily be so passionate about property, but actually they understand that property is a vehicle to give them the financial needs to be able to take the next step. [00:13:00]	So for example, some people when they go to set up a business and they go from being an employed person or a self employed person, and they want to start a business, they understand that, "Oh well, starting a business might cost me money". There's a lot of startup costs or, actually, "it might take me ages to get my first few clients, and therefore you know, I'm going to have to go back to work at some point because if I don't make my business work I've got no money in my bank, how am I going to pay the bills?" [00:13:30]	So actually by investing in property and building that passive income to start, and what I say to people is when I'm saying financial freedom, to start, which we look to achieve in the first 12 to 18 months, is that when you're financially free, effectively all of your assets are paying for your liabilities. So if your monthly expenditure is your mortgage, your gas, your electric, whatever that monthly figure is, we can replace that with passive income. So then you can go off and do things like, that you actually want to do. [00:14:00]	Whether you want to travel the world, or whether you want to go and help people do something, whether you want to set up a business and not have to worry about the financial stress. I feel that a lot of people, financial stress when they first get started. As I was listening to your story as well losing the money in your parent's garage, it can be quite painful. And I want to ease that pain for people. Sam Ovens:	Got it. And then, so you were doing this yourself first, and then you had a job, and then you didn't like it so you quit and you used property to help you quit, and then you started to get success with property, and then you figured, "Hey I used to be like this, I'm sure other people are like this". [00:14:30]	And so therefore other people could benefit and learn from what I can tell them. And I can see how this lines up. Then, why did you join Consulting Accelerator? Richard Norris: [00:15:00]	I joined Consulting Accelerator because I knew when I was going to basically, I was offering a service that was going to help people, so like an education platform. Which, when I saw Consulting Accelerator and your results were phenomenal, and they are phenomenal, I just resonated with you Sam. You're one year older than me, and everything you were saying was, "I believe in exactly what Sam's saying". I've been thinking this for a long time but maybe I didn't take the action when I was 21 or 22, like I was too comfortable, I was in the corporate world because I thought that, again society chose you, tells you to do that. And even my dad and parents told me to do that, like go do an internship, go to university, then get a good job. [00:15:30]	And even the higher up I became in my job, I was still like, I'm never going to make the money that I could on my own. I was already seeing results, like in my medical job, running a business within a business, and I was getting quite good results in the business, but I wasn't really still seeing the financial rewards. [00:16:00]	And then I just listened to your program and I was like, what I want to do now is teach people how to do that. But I didn't necessarily know Sam, exactly the best way to approach it. I had all the tools and I was doing it myself, but then when I thought, when I'm going to teach people and put a program together and coach people, then I need to go to, what I believe is the best person in the market today, which is you. And I want to learn, I want to learn how to do it right from the start, and set the foundations. Because that's going to be fundamental for my own evolution as I go through the process. Sam Ovens:	Got it. And then, how did you learn, how did you find Consulting Accelerator, and me? Richard Norris: [00:16:30]	I found you online, on the Facebook, like one of your Facebook posts came across, and to be honest they kept popping up, probably through your paid funnel. And then I went on your webinar, and I listened to your two hour webinar, and I was blown away, Sam. Like what you're saying is just unbelievable. Your message resonance, how you get message resonance across is unbelievable too, and for the skills and tools that you've taught me, just in the first four weeks have, my results have been phenomenal. [00:17:00]	I set myself a goal and I was like, I just want to get 10,000 a month, and already last month I did 30,000, and I just was blown away by it. And I think that one of the reasons as well why, I know I'm digressing slightly here, but I think one of the reasons why I managed to do that is because you're filling the gaps where my I needed filling. So for example in my first 30 day attack when you talk about reverse engineering your goals, and setting that mathematical calculation, like that was profound. That was like maybe the last bit of the jigsaw. [00:17:30]	I'm super focused now, and I knew every single day exactly what I needed to do for the next 30 days. And I even went on holiday last year from building the passive income property and took my family to Disneyland. And I just blocked out in the calendar 25th of August til 2nd of September, I'm not here. So therefore it's like I was left with 25 days instead of 30, so I made sure in those 25 days I just reverse engineered it. Exactly like you said, and made sure I made longer on those days, doing my direct outreach. Sam Ovens:	Your own family, so you've got kids? Richard Norris:	Yes, so I've got a partner, and she's got kids, so they're her children but they're not my stepchildren. But I want to help them as well you know in life. And leave a legacy. That's why property is also good, to help my family in many ways. [00:18:00] Sam Ovens:	Because I was thinking, "You took your dad to Disneyland?" Like when you said your family I was like ... Richard Norris:	No I think he might get scared of the roller coasters now, he's not really that sort of person as well to be fair, he's quite introverted. Sam Ovens:	Got it. And then, so you joined Consulting Accelerator, you started going through things, and what started happening? What did you start to implement that you learned from the program? [00:18:30] Richard Norris: [00:19:00]	So the first thing I did was obviously picking my niche, which I already was kind of like understood what it was I wanted to do, but when I looked at property investing, I was like well is it going to be property investors, is it going to be every day people, is it going to be first time buyers? And I'll be honest I had a bit of difficulty with that at the start and understanding what niche I should pick. And then going through your program and doing the research and understanding some of the problems, and doing my live market research, like speaking to people, I quickly understood that there was a big problem with the current education in property. [00:19:30]	I understood very fast that people were going to these events and they weren't getting the results that they wanted, and the reason for that was like, if you kind of understand the cashflow quadrant, going from a self employed person and an employed person to a business owner and investor who operates what I'd call the right hand side of the cashflow quadrant, the transition's huge. And they were stuck in a mindset where they were going to the education classroom events, and they were doing the three day events, and they kept going to the three day events. They were getting all the tools and strategies, that supposedly work, and to be fair they do work, their mindset was so far from where it needed to be. They needed a change in paradigm. And that's what your program helped me to identify. That I could give somebody all the tools and strategies, and you can do that in a classroom event, but if they're not ready to take that information on board, and they're not ready to operate on the other side of the cashflow quadrant because they're stuck, in their habits of being an employee and employed person, then it's going to be very difficult for them. [00:20:00]	And that's why they weren't getting the results. And there was no sort of support systems in place, there's nothing that's revolutionary, like what you're offering us online. You've got live chats, live Q and A's. And I thought, "Well actually, the market can be revolutionized and shaken up here with sort of, implementing the tools and strategies that you're teaching in the program. And when I did my market research, I found that, and I clearly understood what people's problems were. [00:20:30]	And then I got my messaging out, and I started posting and doing. See this is where the huge change was I think, Sam, for me. You know you said like, when you look at other people, and you judge people for doing something, you end up not doing it yourself because it's like, that's your own insecurity. Life's a mirror. And I realized I was doing that but not realizing it, like I was quite introverted, I was thinking, "I don't want to post my results, because I don't want people to think differently of me, I don't want people to think like ... or comment about what I'm doing". [00:21:00] [00:21:30]	So I didn't post my results for a long time, in my own property journey. And then I saw your program, and learned that actually I need to be doing daily outreach, I need to be doing daily Facebook posts. And when I started doing daily Facebook posts, the world sort of changed straight away. I looked at what you taught me, I looked at the market resonance and how to get market resonance. And I started constructing nerve-striking messages, that resonated with the people that I were looking to attract, and then all of a sudden my Facebook inbox, my messenger, started getting full with people. "Wow, your results are amazing", "How did you do that", kind of jumping a call, then I did the 15 minute chat, [inaudible 00:21:27] strategy session, and I closed my first client in that way from a direct outreach Facebook post. Sam Ovens:	Yeah I think where people get confused is you know, we're kind of taught and conditioned not to show off and brag. You know? Richard Norris:	Yeah. Sam Ovens: [00:22:00]	And that is a good lesson, it's not really a good thing to show off and brag, but the purpose of us posting our results isn't to show off and brag. Like we're not just doing that to feel good and actually, you know, try to do anything like that. We're doing it to make other people aware of results so that then they can think, "I want results", you know what I mean? Richard Norris:	Sure. Sam Ovens:	They have to see that it's happening in order for them to believe that it can happen, you know what I mean? Richard Norris:	Yeah. Sam Ovens: [00:22:30]	So we're doing it for a different purpose, and I think that's where people they can't classify it, the intent of the action properly. They still think it's showing off. That's what happened with me a lot. And that's why still a lot of people perceive it the wrong way. You know it still happens. Like a lot of people see it and think, "You're just showing off". Richard Norris:	Yeah I can relate to that, and that's the thing, with my mindset and how I see it now, and exactly what you said there like, your results are helping people Sam. You're getting a lot of results and it's helped my life and helped me structure things in a better way, and going through the rest of your course I know it's only just going to transcend itself and I'm really excited about that. [00:23:00]	What I want to do is I realize that actually, I'm not actually posting about my results, I'm really actually helping people to make a difference. Like sharing my knowledge with people is going to help them get better results, which is going to improve their lives. Sam Ovens:	With what we do, we're helping people make money, right? Richard Norris:	Yes. Sam Ovens: [00:23:30]	It's like, imagine this example. Let's say somebody, let's say Michael Jordan, right, he wants to create a course and teach other people how to play basketball. But let's say all basketball games and all scores from all basketball games, and all footage of Michael playing basketball and training, and anything to do with basketball was all concealed. And you couldn't see it. Then you're just supposed to trust him, that he was good at it. You know what I mean? But Michael Jordan doesn't have to say he's good and share his results because everyone knows them, they're transparent. [00:24:00]	And that's not considered showing off that the basketball score is showing there, you know what I mean? But with business it's different, because it's all concealed, because it's a private company and the only people that can see that is the government and us, and our accountant and things. We have to show people the score, we have to share those things. It's a little bit different, you know? Richard Norris:	Yeah, no I understand. [00:24:30] Sam Ovens:	And then you started going through the course, you found your niche, and you already had your niche, you found clarity on, "This is exactly what I want to do". And you also found a problem in the market in that a lot of people who want to invest in real estate and have success with real estate, they're paying a lot of money to go to these events, and seminars, and they're not necessarily getting results. [00:25:00] [00:25:30]	I've always found that one fascinating too, it's because ... I think it's because change is, especially going from a normal employee to a successful entrepreneur, or investor in real estate, there is ... that's a big change. And it doesn't just happen from an event, even if this event is three days. Like when do three days ever ... You know change takes time and you need constant exposure to stuff in a community, you need it to go for a long time, but events can't go for months. So the vehicle, online courses with communities and things, they're a bit a vehicle for change compared to an event. Richard Norris: [00:26:00]	And that's the other thing as well, you've hit the nail on the head. Not only that, but like you know with [inaudible 00:25:46], recording software and everything now and doing things on videos, there is no traceability when you go to these events, you can get the information. As you say, as humans we're programmed to forget, and I read my daily affirmations everyday, I listen to them everyday, I do all that stuff in the alchemy planner because, in the alchemy of self, because I don't want to forget those things, right? So I looked at that and thought, "That's the same in property". [00:26:30]	Okay definitely, nobody wants to forget their mindset stuff and I understand that that's why I need to do it every day, I also don't want to forget how to do the calculations and work out return on investments, the reverse cash flow, the yield, and all these important fundamentals that they get taught at a three day training event and then they can't remember it, they can't employ it in the market. So by giving them the videos as well, it gives them ... and actually what I'm actually creating now and being revolutionary with is actually giving them and implementing them like business systems. So what I'm saying is that one of the biggest problems I've recognized is that when people go from the employed person or the self employed person, they don't know how to operate a business with systems efficiently. And like you said, it takes time. And they're expected to go out and find property deals and then structure their property deals, taking investor's funds. That's a business, they need business systems to help them with that. [00:27:00]	And I'm basically creating a one stop shop, with all of the legal teams in who are specialists in this area to help them, and make that transition easier for them through my program. And actually giving them like, tailored Excel spreadsheets where it automates stuff for them to make their life easier when they go to the market. Sam Ovens:	Yeah there's so many things you can do to really help, like when you get into it. Richard Norris:	There are, yeah. Sam Ovens: [00:27:30]	I always remember going to like an event and the person would say, "If you want to get customers, you just create a funnel, and you've got a funnel and some different pages, and then you use Facebook ads and you drive some traffic to this tunnel. And then you've got your product, and it can be priced here, and then you sell it." And everyone's kind of taking notes and kind of nodding their heads, and I always remember thinking, "Yeah dude, but how?" [00:28:00]	Like just creating some Facebook ads, that's not as simple as five words. Like just creating some ... there's so much depth and detail to all of these things, and then people go home with these notes and then they can't implement them because they're missing that depth. Richard Norris: [00:28:30]	Exactly. And that's exactly the same experience that I've had. And now I wanna basically through your program and the tools I've learned, implement that. And I'm starting to implement it and it's working well so far. And now I just need to look at how to scale that up, and make sure that I can still deliver. And bring in the support systems. So I'm really looking forward to continuing the program and going through the next to the paid Facebook advertising, and how that works. Because it's just been organic so far. Sam Ovens:	And then, how did you decide you know what you were going to include in your program, and how did you decide what you were going to charge for it? [00:29:00] Richard Norris:	The charging part was basically determined a bit by your training program as well. You know where you say, "You must charge at least $1500 per client a month", otherwise you're not solving a big enough problem. If you can't charge that, you're not solving a big enough problem. So when I looked at it, I was like well, initially to get it started for like a, "Done for You" service, from the evolution, or a, "Done with You" service, like a one on one, then that's going to take up a lot of my time. So I thought well actually, I've got so much information here, that I need to give it then, maybe a step by step over six months so they don't get overwhelmed with it. [00:29:30]	And so I thought well, $1500 a month is around about 1200 pounds U.K., so I thought 1000 pound a month was sensible to do that. And when I looked at the education platforms on the market as well I understood that maybe they were offering 18 months of like, training which was at three day events. And they were charging like 20,000 pounds for that. So I thought well, to get started, 1,000 pound a month seems quite a good, reasonable amount for somebody to pay. [00:30:00]	And then in terms of what I included as content into my program, I think just from my own evolution process over the last 15 to 18 months of doing in the market, and I realized actually when you get out there and doing the market, although there's a lot of challenges, when you come up against adversity and you have a solution's based approach, you start to really understand exactly how you can solve the problem yourself, and do that for other people. [00:30:30]	So I've already got a good idea of the problems that people are going to face because I've already walked the journey and I'm already doing it, and I'm live in the market today. And that's another thing as well which really resonated with me about you that you're live in the market and you're doing it, right? And some people that go to these three day events, like people are teaching strategies that they did 40 years ago. The market's changing, it's like you say in one of your training videos about evolution, and if you don't evolve you're going to get wiped out by the competition. So I always want to be evolving and be at the forefront of the market and 10 steps ahead. Sam Ovens:	Yeah. It's shocking but you'll find that most people are teaching strategies that they didn't do ever. Richard Norris:	Yeah. [00:31:00] Sam Ovens:	Not even joking, that's what is going on. That's why that meme exists that says, "Those that can't do, teach". Richard Norris:	Yeah, that's right. Sam Ovens:	Because there's a ... Most people teach and don't know how to do it. And that's messed up, but that doesn't mean that that's forever like that. That's the state of the diseased marketplace. But those that do teach best. Richard Norris:	Yeah, sure, definitely. [00:31:30] Sam Ovens:	And that's what I always think. I don't look for managers inside my company, internally, I just look for doers, and the best doer, will be good at managing. But even if they hate management, and they don't know anything about management, because all management is doing is making sure people are doing. And so if someone's really good at doing, they're good at that. And the best person to create a cause is not the best teacher, not the best communicator, but the best doer. [00:32:00]	And so I never learned anything about teaching, I just made sure I was good at doing and then it turns into a course. You know? Richard Norris:	Yeah. Sam Ovens: [00:32:30]	And then it works. So you've always just got to make sure that you know how to do it, and you know how to do it. And you know how to do it when it gets results predictably. And when it does that, then you know how to teach it, and that's always the grounding mechanism I use to make sure something is going to work. I make sure that it's grounded in doing. Richard Norris:	Sure. Sam Ovens:	And it sounds like that's what you want to do too, stay doing it, to keep your strategies sharp and everything, and then teach as you're doing it, so that it's always like that. Richard Norris: [00:33:00]	100%, that's the exact business model that I've set, and when I did my dreams and set my goals out and my vision. That was exactly it, like I've got three parts to the company, but I'm focused on doing one thing. I'm focused on real estate, and part of what I do every day, can just be shared with clients. And there's no reason why if they don't do what I teach them to do, a bit like you do in your program and keep evolving that they shouldn't, that they can't get the same results. Sam Ovens: [00:33:30]	Yeah. I mean, my philosophy on it is that, some people think you shouldn't share your strategies because then someone might be better than you. And I'm like, that's what someone ... That's what like a loser would think, you know what I mean? If someone's going to beat you, they're going to beat you, regardless of whether they get your information or not. That person will get you. So if you're scared of that you've already lost. And you've got to know that even if you give it to people you're still going to win. Richard Norris:	Yes. [00:34:00] Sam Ovens:	And you're giving them an advantage, but I kind of like that. Richard Norris:	Yeah exactly, and I think it like you say Sam, as well, it comes down to your mindset too. And that's why I believe that your mindset that you're teaching is so profound, and helps shape people to get results. Because if you're thick skinned and you're resilient, you're prepared for anything in life. And it's like you say you go to battle with your warm up and stuff, it's like, what are you prepared to do to make it happen? [00:34:30] [00:35:00]	And it's like, I've got that same attitude that I've adopted where I just want to be a winner, it doesn't matter what comes my way, just give me a problem, it's okay. Let me work at it, let me find a solution to that, because when I find a solution to that, I know I'm going to get the exponential growth that comes with it. Even if it takes a while to find the solution. And I want to find it as quickly as possible, but if not that I'm going to go until I find the solution. I'm not ever going to throw in the towel, ever. And when you get that mentality, that winner's mentality, then I think I 100% agree with what you're saying, you can't lose. Sam Ovens:	Well losing, a small loss, you can get something wrong or make a mistake or lose a little thing, but that's just, that's a battle within the war. You know what I mean? Some people treat those things like they're the war, but they're just battles. And the whole war, it can only really be lost if you give up. Richard Norris:	Yes. [00:35:30] Sam Ovens:	So that's the way you've got to view it. And then that way you can't lose. It doesn't necessarily mean like you're going to win the whole war but you can't lose. Richard Norris:	Yes. Yeah I understand that. It's a good philosophy. Sam Ovens:	And so, how did you get your first client? [00:36:00] Richard Norris:	So yeah, my first client was through direct outreach from a Facebook advert, so I just put out a Facebook post about the success I'd had, and my latest project, which was the office building to 11 apartments. And then somebody private messaged me, and it happened actually to be, just happened to be somebody that I knew from the past, and had basically sort of been watching from the sidelines maybe what I was doing. [00:36:30]	Because they saw my results, I'd posted, they got in contact with me, and then we basically had a chat, and they ended up signing and becoming a client, and that's how I got my first client. Sam Ovens:	So you said, Facebook advert and post, it was a post, right? Richard Norris:	Yeah sorry Facebook post, yeah. Sam Ovens:	From your personal Facebook page. Richard Norris:	Correct, yes. Sam Ovens:	Got it. And so you did a post there where you told like a story about the results you got, put a screenshot or something in there. Richard Norris:	Picture of the flats, yeah. Sam Ovens: [00:37:00]	Okay, cool. So you told a real life success story and then what sort of, did it have a call to action or a asking them to do something at the end? Richard Norris: [00:37:30]	There wasn't actually, it was just, you know in your direct outreach, that was a bit earlier on in the program, and I think in your direct outreach you said just make it, if you can, post once a week, and if you really can then post every day. So I just started doing the daily Facebook posts every day and I was sort of constructing them. I just put the Facebook ad out, laid out the story and just put the picture of the apartment, so I didn't even put a call to action, it was just like throw it out there and see what comes back. And then actually even from that one post, there was a lot of comments and a lot of people that inboxed me, private messaged me. [00:38:00]	Which, I was kind of like, sat there one night thinking, my phone never goes off because I never post on Facebook, and then like all of a sudden maybe like 100, 150 Facebook messages and I was like, "What is going on", like from that one post. And I realized that, "Wow, Sam's stuff works, and not only does it work it works well", and if you get the message resonance right, I tried to do the market resonance from my market research. I incorporated what I'd learnt from your program about market resonance and trying to write in a way that strikes a nerve with the market. And by doing that I just got a lot of interest. Sam Ovens: [00:38:30]	Your personal network is strong, this isn't like an ad going out to strangers who never have heard of you before. These are people who you've grown your network with through life, and they know you and they haven't seen this side of you. They kind of know it exists, faintly, but they don't have much detail on it. And so you're giving them that exposure, which is first of all very interesting because they've always wondered, and second of all, you're making it seem like they can get it too, which they probably want it. Richard Norris:	That's true. Sam Ovens:	And so you can see how this is, it does have the result that happened. Like you can see how this happened. [00:39:00] Richard Norris:	Yeah definitely, 100%. There was always, by doing that as well like you said being through the personal network, there was always I guess that emergence of trust. Because I feel, I don't know what you'll feel on this, Sam, but if it's okay whilst we're on the call I might ask you actually, how do you think you gain the emergence of trust from somebody? [00:39:30]	Because I found that one of the challenge with the direct outreach messages, so for example on Facebook when you add somebody and then you've never met them before, they don't know who you are, and they go to your Facebook profile and looks good and they see your results, and you message them and you put the short message out there to get them on a 15 minute quick chat. And then you get them on the chat and then I get them on a strategy session and then sometimes it's like well one of the reservations is like I know that what you're offering sounds great, but for me to put that much money and I've never met you before, like sometimes they wanna meet personally. [00:40:00] [00:40:30]	And I was just wondering how you get the emergence of trust or what your views on that ... because one thing I learnt previously, and I don't know if you can relate to this, but when I was in the medical devices world, I got to work with some very successful people who had grown big businesses really fast. And I'm talking like billion dollar companies. And one thing stuck with me, he said to me when I was over in the manufacturing plant, he said, "Whenever you're getting a surgeon's trust," he said, "you can sit there and say anything you'd like to him all day, but the only way he's gonna get the emergence of trust if he just takes the action and starts doing it and goes through his own proprietary lending process." But I don't know what you think about that and how ... Sam Ovens: [00:41:00]	So, it's ... First of all it happens a lot based on your own confidence, all right? Because you receive back almost a reflection of what you're giving in the other prospect. Do you know what I mean? So that, like in the beginning, I used to have people, "Oh I wanna meet in person," or I wanna do all of this stuff. And now I mean most of our money is made without me ever talking to this person, not even exchanging an email or anything. It's just, it's like automated. And you really have to engineer like the pieces ... It's way easier to sell someone who knows you and knows everything and trusts you, right? Richard Norris:	Sure. [00:41:30] Sam Ovens: [00:42:00]	That's effortless. It's harder to sell a complete stranger and you need to figure out what additional pieces you have to include in your process so that you can get them to trust you and convert. And then a lot of it, like things have to be said and they have to be covered, that's true. But also a lot of it is your conviction and your conviction in yourself and your process and everything. Like when you just absolutely, just believe 100% that this thing works, and the only way you can do that by the way is if it's worked really well and you got lots of results, then it's kind of the reaction to have conviction, isn't it? Richard Norris:	Sure. Sam Ovens:	Then it shows through and it changes everything in the call. Or in the sales process or whatever. Yeah those are the main two things. I would say you just haven't done it long enough. You haven't talked to enough people. Richard Norris:	Sure. [00:42:30] Sam Ovens:	Like good things start happening after a thousand phone calls. Richard Norris:	Yeah. Sam Ovens:	The people who have, like ... Pretty much everyone who's made seven figures through my programs, they've made more than a thousand phone calls. It's an interesting kind of metric. Like seven figures, more than like 86 grand a month, tends to occur after the thousand phone call mark or around there. And then the more strategy sessions people have done, the more money they make, the better they are. It's just a practice thing, you know? [00:43:00] Richard Norris:	Sure. Sam Ovens:	And you learn so much on that. The nuances and the different things and it changes. It's not ... What you're seeing now occurring in these calls will not be what happens when you've had more practice. Richard Norris:	Sure. I can totally understand that. That makes perfect sense. Sam Ovens:	Practice is generally the solver of everything, you know. [00:43:30] Richard Norris:	Yeah. Practice makes perfect and there's maybe something to be said about that. Sam Ovens:	Yeah, that's true. And so that's how I got good at anything. Like I wasn't good at anything like when I was born. Like you know everything has to be learned and the things I'm better at I've done more than the things I haven't. The things I've never done before, like speaking Mandarin for example, I'm not very good at it. Richard Norris:	Yeah, sure. [00:44:00] Sam Ovens:	It's not because I'm naturally not good at speaking Mandarin, it's just a practice thing. Richard Norris:	Yes. Sam Ovens:	And so, you got your first client that way. How about the other four clients. Like, how're you getting them? Richard Norris: [00:44:30]	Yeah, the other four clients was actually a bit of an interesting process, but it's kind of like it just ... I wanna say like it just happened, but it didn't just happen. I actually got invited to speak at a property event because of some of the results that I had had in my own portfolio. And I basically just told my story and did it authentically and said, "Look this is what happened. I started 15, 18 months ago. I was a zero and now my portfolio when it finished the apartments is gonna be at like 1.5 to 2 million." [00:45:00]	And that doesn't even include the land development. The land development, if I end up building up the five apartments then that thing's worth like 2.3 million ... I will it for 2.3 and the profit margins are about 20%, so they're good. But like people I think were so interested in the fact that I'd gone through the whole evolution so fast. And maybe that's because of my attitude and mentality. Some people I think their mindset is like I can't do commercial to residential development, I can't do a land development first because I've got a lack of knowledge, or I don't have enough money. The biggest one is I don't have enough money. [00:45:30]	Well it's like, well if you can find an investor and you've got a good business model and they're willing to ... and you've got all your exit strategies in place and you can get the money then, like you can do it. And part of what I'm teaching them in the business is that you can leverage off other people's experience. And I believe that's how to grow a company as well. Like you say, we can't be good at everything, so I wanna fill in the gaps. So it's like my team that builds the apartments, I'm not a builder, I'm not good a building. But maybe I'm good at bringing in the expertise and finding the right people to deliver a good project that I can trust. And finding the money. Raising the finance. Getting the investors involved. And setting up the structure. [00:46:00]	And then when I leverage out to the people that can build it and do it a great job and have built up to maybe 40 million pounds of developments, like for them, 2.3 million pound development, it's just five apartments where they may be doing like 150, 200 units, is like easy for them. It's like I'm bringing the thing. And the expertise. [00:46:30]	And I spoke about it at the event and I think from your course, again, I keep coming back to market resonance, because everything I was saying was striking a nerve. And when I finished that course, like people come up to me at the end of the speak ... People were coming up to me at the end of my, when I finished speaking and they said you know, "Can I have your contact details? Are you helping people? How'd you do it? What are you doing?" Had a brief chat about that and the next day everyone had Facebook messaged me. There was about eight people that had Facebook messaged me of which four closed. So I closed four using the conversion script as well. So you know you definitely helped, the conversion script and to take them through that process. But I think the thing is from your course that really helped with getting those four clients is the market resonance and how to convert them. [00:47:00] Sam Ovens:	It's kind of a framework to apply all of this into and get it distilled out into something. Richard Norris: [00:47:30]	Exactly. And that's what's really helped me. It's given me an insight into basically laying the foundations down. Because when anything's new, it's like, I believe mentors and everything the like, we should all have those because whenever we do something new like, we can't do everything. And if we wanna do something we need to find somebody who can help us. Like you say, it's like getting ... Do you want the winning combination? Do you want the winning lottery ticket? Or do you want to struggle for years doing it yourself? Like even with the same ... I knew that I had the knowledge because of what I had done. But I didn't know how to push that out into the market and your programs really helped me to do that and to really understand how I can actually revolutionize the real estate investment arena and basically improve it. [00:48:00] Sam Ovens:	Got it. Cool. And what is like the future ... What does the future look like for you? Like where you wanna be five years from now with what you're doing here. Richard Norris: [00:48:30]	Yeah in five years from now I've got quite a big dream. I've set my vision board quite big. And I'd like to be ... I'd like to have an online education platform for property investing, which teaches people, everyday people how to basically quit their nine to five job and learn how to grow a successful property portfolio using investor's money. And helping them implement business systems. And basically taking them through the evolution of property. So for example, you've gotta start with [inaudible 00:48:30] first and set your foundation. And then these people wanna maybe start doing their own land development, so helping them set up successful real estate businesses. But they've also gotta go through their own evolution journey. So the different stages I wanna set out in an online education platform the stages that they need to go through. [00:49:00]	And I wanna give them the support, like one of the things I'm finding is that people in the education market, the property education market like they don't have any support. There's a lack of support. Like it's classroom based and they haven't got that continuous support that you have in your Consulting Accelerator group, which has been awesome for me. Like I reached out to Nick and Nick just took the time to shoot me a quick video. It's like that support makes a difference because, you know, I was struggling with my message and to start with I just didn't get it right. It was me, I didn't get it right. What you say works and I just misunderstood it and I didn't get it right. I didn't implement it correctly. Sent it to Nick and Nick was like, "Dude, just do this," and sent out 50 of message A, 50 of message B, and sooner or later I was like getting strategy sessions like instantaneously. [00:49:30]	So it's just the little tweaks that really help and I wanna help people. They could be frustrated there for ages, but they just need the little tweaks. And actually having that support and setting up an online like support chat system and things like that. And by the market's going it's gonna add value to these people. [00:50:00]	But where I want to be, I want to be in a position where I've got like a lot of real estate investments, like I want like ... I'd love to have a portfolio that's worth over 100 million as a data point in the next five years. I would love to be like building even maybe like hotels, that'd be quite cool. And I've got some connections to the Middle East and I'd like to start building stuff over there, like some luxury hotel resorts over in the Middle East. And I'd just like to have one of the most profound education platforms in the real estating market for basically knowing ... basically helping people quit their jobs and learn basically create a passive income. And whatever that passive income be to quit their nine to five job or whether it increases somebody's pension as a secondary income, there's lots of reasons why you should invest in property. [00:50:30]	And like if you make a lot of money anyways, as you probably already know like it just sits in the bank, you're making like what, 1.5, 1% a month. It's devaluing, your money becomes devalued because the rate of inflation is higher than actually what your interest savings account's giving you. So I just want to help people and help them invest safely. Sam Ovens: [00:51:00]	Got it. Nice. And you said something interesting, you said you went through the training but you didn't quite understand somethings ... like you understood them a little bit different. And then when you talked to Nick Hauser he helped you understand it. This is a fascinating thing I've observed. It's like if I say dog to you right now, just picture what pops into your mind, right? What color's that dog? Richard Norris:	It's a white fluffy dog. Sam Ovens:	See? All right so, when I hear the word dog I just see brown dog. So we might hear the same word, but we see different things, right? Richard Norris:	Yes. Yes. Sam Ovens: [00:51:30]	And that's what's fascinating because whenever people are communicating they're using words, but with every word that person has something different that they understand that word as. And so when we start having lots of these words and lots of these perceptions and every single individual one of them is slightly different, we end up with people understanding different things from the same explanation. You know what I mean? Richard Norris:	Sure. Sam Ovens:	Which is really interesting. And that's why this occurs. Richard Norris:	Yeah. [00:52:00] Sam Ovens:	And that's what I've noticed with the program too. And that's why the support is so important because no matter how clear and no matter how perfect you get your program, people are still going to have misunderstandings and confusion because of that. Richard Norris: [00:52:30]	And that's really, again you hit the nail on the head with what you said there. It's just tweaked sort of a light bulb moment in my mind. You know when you said like when you get things perfect, that's another thing that I struggled with. Like I have it up because I wanted to have all the answers right now. And I've thought in order to go to the market I need to have all the answers and everything must be absolutely perfect, otherwise, it's not gonna work. Or people aren't gonna like what I've got to offer. And then I realized from doing your course as well that, you know what you said at the start about picking your niche, you know, that's the example I'd use. Like when people are struggling to pick their niche it's like just pick one. Like pick one and take the action and things unfold from that. [00:53:00]	And that paralysis sort of came in with me with the letting go into the market with me with my education stuff before I came to your program when I realized that the reason I was doing it was because I can just relate a lot, I just wasn't picking my niche. Or I just wasn't taking the action and I was paralyzing too much. Like I sat there procrastinating but thinking I was being productive because I was overthinking it. And thinking that it must be perfect. And not everything in life have to be perfect. Just take the action and it will unfold and you'll get the answers and just trust in the process and believe that you will get the answers along the way. [00:53:30] [00:54:00]	And it absolutely, that's exactly what's happened. The moment I took the action and just thought you know what I'm just gonna trust exactly what Sam said because he's got amazing results and I know it works, I've seen the results so it has to work. So if it doesn't work, the only reason it doesn't work is because of me. So what am I gonna do to make sure it works? And I just took the action and just followed it and now last month, like I say, it's kinda my exponential growth moment and that's when I really started to believe I really can do this. And I definitely can get to where I wanna go and I'm just gonna keep following everything to the exact T and just keep doing it and course correcting and iterating. And as you say, making the boat go faster. Sam Ovens:	Nice. And then what would you say has been the one most transformative part of going through the Consulting Accelerator program? Richard Norris:	When you say transformative part ... Sam Ovens:	For you like in helping you transform change. [00:54:30] Richard Norris: [00:55:00]	I think the mindset at the start. Like just understanding that basic concept of it's never important who you are, and as you said, it's only ever important who you become. Like that is the thing that resonated with me the most. And I was like when I did that exercise and I realized like who I am and who I need to become, I was like, that in its own right is profound because it's right. And actually for the first time I sat down there and I looked at myself and thought, "Okay, how do I think about certain situations? And actually how does the person I want to become, how do they think about situations?" Well I know where the gap is. So I'm just working on filling the gaps now to become that person and think differently. And when you start to think differently about certain situations, the results happen. It's like you can give two people the same situation, exactly the same situation, and someone can make massive money from it or make it a success, and some people can just completely mess it up. But I think that the only difference between those is the way they think about it and the way that they face adversity. [00:55:30]	Because like you say, nothing's ever perfect and that you will come up against challenges. You know the journey's not just plain sailing, as I'm sure you explain and as you've said previously, it's just when you're facing adversity, it's like you know when you said when you're 21 years old and your parents guardian, I think you said that you had failed a couple of times in businesses and then you learnt that the market rewards you. And that really stuck to me too. I definitely understood that because, Sam, when I was doing my medical devices ... [00:56:00] [00:56:30]	I'll briefly explain this, but I was helping out ... I basically helped set up with three other people, sorry four other people. So there was an M.D. and I got brought in as one of the people to help basically take the new franchise off the ground in the U.K. and we're delivering patient specific technology to the market, to the medical market in scoliosis surgery. And we were, we were solving a clinical problem, but it was interesting because the same product performed really well in America and it's still performing amazing in America right now. Like I think in the first year they did 26 million of sales. And in the U.K. we failed. And actually in the U.K. it doesn't exist anymore. Like they shut the franchise down like recently. I was speaking to my colleagues who were there previously. And I think it was about two months ago I got a call saying the U.K. franchise is shut down. And I was like, wow. [00:57:00]	I saw that earlier and that's why I made that decision to get out. And the reason was because I realized then that the market only rewards you. They had the same great idea and it solved the clinical problem, but one market wanted it and the other market didn't. Like the U.K. market at the moment there's various reasons why it couldn't accommodate that specific technology yet it's the same product. And one made 26 million and the other made a massive loss. [00:57:30]	And then when listened to your program and I guess that was my first lesson in business, maybe one of my first failures because I didn't realize that when I took the job. And then when I listened to what you said about the market only ever rewards you. I really ... That really resonated with me. And then every time I go and do a development now or I renovate a property and put it to the market, I make sure that I'm just building to the market. I'm giving the market what it wants. Sam Ovens:	Yeah. Richard Norris:	That was interesting for me. Sam Ovens:	Who else are you building it for? Richard Norris:	Well exactly. But you know some people think, as a specific example I must do a luxury property because everyone's gonna want it because it looks nicer. But actually in a given area- Sam Ovens:	That's like some near insane person logic. Richard Norris: [00:58:00]	I know, but a lot of people think like that. That's the thing. I was realizing a lot of people think like that, maybe two years ago I thought that way, well that will look nice so it will rent because it's better than that landlord's over there or that property's not as nice. But actually the market only ever, like you say, rewards you. You've gotta give what people want. And still when people are investing in property and what I'm teaching my students and clients now is exactly that. [00:58:30]	Like sometimes they think well I just need to do ... I need to spend 40 grand on a refurbishment, but I'm saying but does it need 40 grand? Does it really need that? Why does it need that? What, you know, does the market require that? What's the demographic of the area? And they forget to think about those things. And they're like actually oh yeah, maybe I don't need to put that much into it and I can still get the same result. But we're making it fit the purpose. Sam Ovens:	Agreed. And then what would your number one piece of advice be for other members who are in the community? Richard Norris: [00:59:00]	Keep taking action. That take massive action on [inaudible 00:58:50] process, it 100% works and if you get stuck, and you get challenges, like I've faced challenges like we all do, then reach out to the support network because 100% like Nick's great and even the community is great. Like people in the community are so willing to help. And actually you never realize, I say my main piece of advice is this, you never realize how close you are. Like you can be two minutes away from making 30 grand and not even realize it. [00:59:30]	And I was exactly that. Like when I did mine, Sam, I had 15, sorry I had eight calls. And out of eight calls I only had one client. So that's seven calls where like it didn't go that well or they were going well and people like saying yeah I really love what you're offering. And I was like well people want what I've got but they're not closing so what's the problem here? And then I was thinking am I charging too high? There was things that are going through my mind, are you charging too high? Then I reached out to Nick and he was like, well no, you've got one customer at that price point so it's solid. Like you just haven't done enough calls. And I was like well exactly. [01:00:00]	So it's trust the process and just keep doing it. Like you never know. Then the next four clients I closed. Last one had seven nos then four yeses. And it just goes back to everything you say in your program, like what you say works and just trust the process and never give up, even at times of adversity and when you're struggling, like just keep going because your next big win could literally be seconds away, you don't even know about it. Sam Ovens:	Yeah. I wanna make a version of the program where it's like I just program all this into a chip and then you just put it in your brain. Richard Norris:	That'd be pretty awesome. Sam Ovens: [01:00:30]	Because then you won't do these things, you know. Like you do, for you do ... You get a couple of nos and you don't have those emotions and those thoughts like oh I should change my niche, I should quit. Like it just stops that. Richard Norris:	Yeah. That would be revolutionary and a game changer for sure. Sam Ovens: [01:01:00]	It's not that far away. Like I've been watching the technology for awhile. Like they can already do pretty ... They can do things like, by putting like a small electricity currents into your brain at different points, just on the skin they can actually improve like your positivity, or your cognition, or different parts of your brain. Yeah. Richard Norris:	That's really good. Because it is I think like you say, like the mindset's so important and your whole week of mindset that you do is ... it's profound. Sam Ovens: [01:01:30]	Thanks. And how can people find you? Like I'm gonna put this on YouTube and stuff, share it on the internet. If someone's wanting to quit their nine to five job through the use of property portfolios and property investing, how do they learn more about you? Richard Norris: [01:02:00]	They can basically go on my Facebook page ... Go on just my Facebook page, Richard Norris, and then add me as a friend. And maybe for the YouTube video, maybe if it's okay with you, Sam, that maybe could do on my Facebook page too. I don't know how you feel about that, but if it's something that would be okay to share like as interesting for people as a bit of inspiration for my network then yeah they can find me on Facebook. Other than that they can reach out to me via email I guess at this stage. And also check out the property avatar, like thepropertyavatar.net. If they check out thepropertyavatar.net they can go through the funnel and they can see sort of some of the problems and the painful problems I'm solving with my video. Sam Ovens:	Awesome. Well cool man, thanks for jumping on. Richard Norris: [01:02:30]	No, thanks, Sam, so much for everything. And thanks for all your help, like your course is really changing my life and I'm just gonna stick to this and hopefully make six figures and then I can get to come over and see you. That would be awesome. Sam Ovens:	Hopefully. Richard Norris:	Yeah, I will. I'll come over and see you. That would be like amazing. Because seriously I know it sounds [inaudible 01:02:38] and it's not but like I resonate with a lot of what you're saying and people like you inspire me. And you make me want a better place, so I'm gonna keep going. I'm gonna make this happen. And that's my next big goal to come over and make sure I get myself over to California, I think that's the transition now. It was New York, but maybe California, that'd be brilliant. Sam Ovens:	Cool. Looking forward to it. We'll speak soon. [01:03:00] Richard Norris:	Thanks, Sam. Thanks so much. Take care. Sam Ovens:	See ya. Richard Norris:	Bye.